Koleys Solid Brass , highly polished Sanctuary Lamp Back plate 2 _" x 9"
This stunning Sanctuary Lamp is made of Solid Brass in highly polished finish. This magnificent piece attaches to the wall with screws via a back plate that measures 2 ½" by 9" and it extends 8 ½" from the wall. 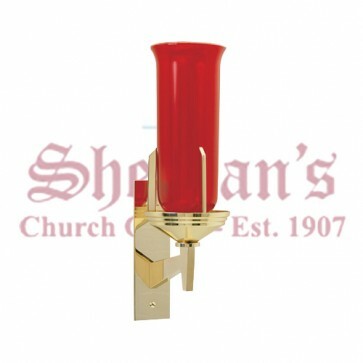 Wall mounted sanctuary lamps are perfect for alcoves and chapels. Glass Globe not included, available at additional cost.